Picture this – your conveyor system, which is integrated with a form fill seal machine, is moving two-and-a-half-ounce fractional pillow packs of coffee. After landing on the conveyor, the packs of coffee move through metal detection and are routed into lanes for packaging. The line is humming along nicely, filling 140 packs a minute. The conveyor belt, which for the last several weeks has been fraying on the edges and showing signs of failure, suddenly gives out…and everything stops. The only problem is, you don’t have a replacement belt. Best case scenario, your line may be down a day or two until a suitable replacement can be purchased and delivered. Worst case – it may be down longer. Your rate of pillow packs has instantly dropped from 140 a minute to zero. People often don’t think of replacement parts until they’re needed. That’s a mindset ripe for failure that needs to change. In today’s hyper-competitive marketplace, companies cannot afford delays in production due to negligence over inventory of replacement parts. There’s no faster way to lose the confidence of your customers or stakeholders within your distribution chain than to start missing deliveries. Having the right replacement parts on hand for your conveyors will avoid that from happening. All too often companies are in reaction mode when it comes to maintenance for their conveyors. Generally speaking, conveyors from a reputable supplier don’t require a lot of maintenance. As such, it’s easy to see why they sometimes get forgotten when it comes to preventive maintenance. Well-built conveyors will run and run for extended periods of time with almost no issues. 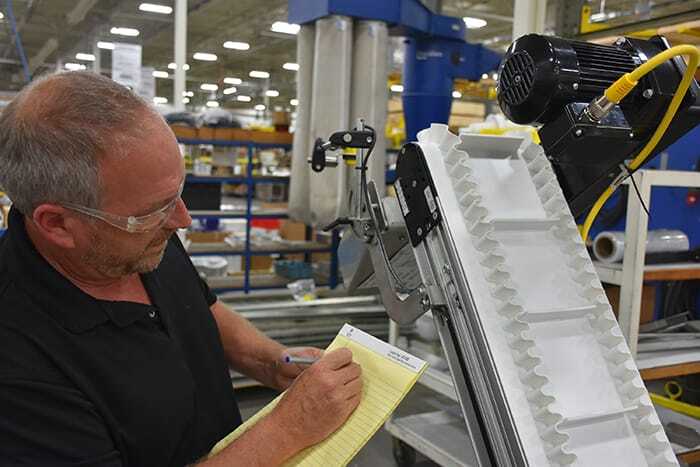 So, when a conveyor does go down for maintenance, some companies are caught flat-footed without having the necessary replacement parts readily available – and that’s where problems can start. The answer, of course, is to have the parts on the shelf when you need them, and the best way to do that is to establish a bench stock of common replacement parts for your conveyors. While that may seem intimidating to set up, it’s relatively easy to accomplish. 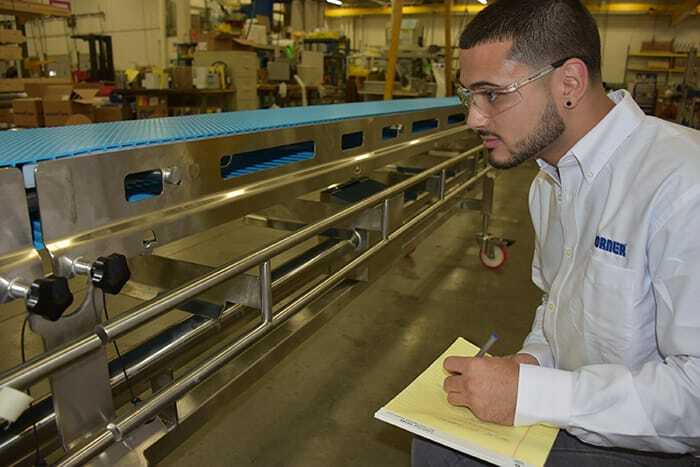 A reputable conveyor supplier can send a field service team to perform an onsite audit of your conveyors and create a necessary bench stock of parts. The goal of the audit is to reduce or eliminate unplanned downtime. This is done through performing a complete review of the conveyors, identifying any immediate critical issues, creating a list of replacement parts and providing a report on the overall condition of the conveyors. Audits should always be done onsite and in person. Being onsite allows the field service team to determine if any of the conveyors have been modified or altered. Even though it’s not ideal to modify conveyors, an audit can still identify potential maintenance issues, and recommend replacement parts to keep them operating as well as possible. Common replacement parts include belts, drive tail and idler tail kits, pulleys, bearings, as well as gearmotors and accessories. With belts, a general rule when you have multiples of the same conveyor is to keep at least two replacement belts for each style of conveyor operating in a plant. That way, if two belts are damaged in a matter of days, the belts can be quickly replaced with minimal downtime to the overall operation it supports. Since many of these parts within the drive tail and idler tail work in conjunction, and similarly wear out at about the same rate, it’s recommended to replace all parts together. That’s why some manufacturers bundle those components jointly under one part number for ease of ordering. This ensures you have all the necessary parts on hand for quick repairs. With your bench stock identified and filled, the next step is to initiate a preventive maintenance program. A well-designed preventive maintenance program accomplishes three main goals: provides training for maintenance personnel and equipment operators, extends the service life of conveyors and proactively identifies areas in need of attention before they affect operation. These goals ultimately contribute to saving you time and money by better managing resources and avoiding a costly shutdown of a production line. One of the first things to consider in setting up a preventive maintenance program is evaluating the type of environment in which the conveyors are operating. A wet environment, such as food processing, or one that’s harsh, such as a metal stamping, will require more attention to conveyors than a clean environment such as automation or packaging. Still, even a packaging application will leave dust that can collect on the conveyor and sensitive components over time. As a general rule, all operating conveyors should be inspected monthly, with those working in a dirty or harsh environment on a more frequent basis. Training is an important component of a preventive maintenance program. 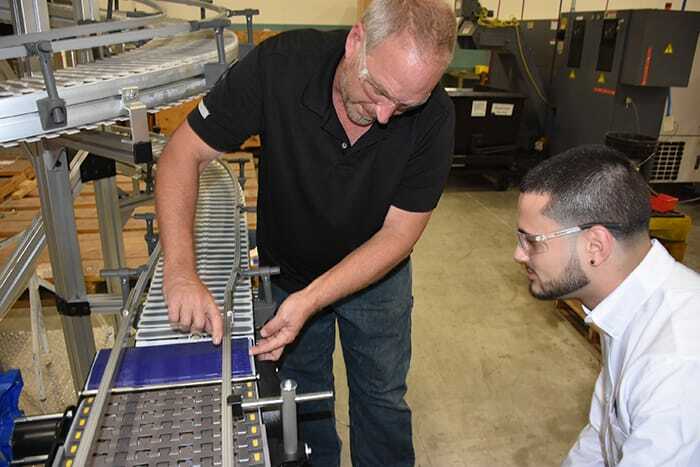 Maintenance personnel need to be up-to-date on the latest techniques and procedures in repairing conveyors, and in turn, they can train equipment operators on what to look for in detecting issues in their conveyors. This is important because the eyes and ears of employees who work alongside conveyors are often the first line of defense to detecting a potential problem. A good practice for equipment operators is to visually inspect conveyors in their work area before and after each shift. 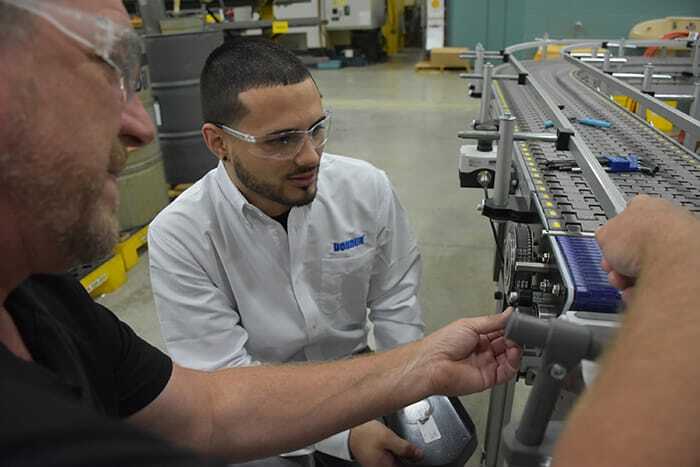 Reputable suppliers regularly conduct train-the-trainer sessions with custodial staff to review conveyor maintenance procedures; information can be passed on to equipment operators as well. This training includes everything from proper greasing techniques, identifying belting issues, recognizing component wear clues and learning about other maintenance issues. This initial site visit can be accomplished at the same time as the parts audit. Depending on operational tempo of the conveyors, preventive maintenance visits typically occur every six or 12 months. Having the proper replacement parts on hand will save you money in the long run by reducing conveyor downtime. The first step is to complete a parts audit of your conveyor system, and get those common replacement parts on the shelf. Establishing a preventive maintenance is critical to keeping your conveyors running smoothly, and also identifying any parts that need replacing. The last thing you want to happen is to have your conveyor system break down, and not have the parts to place it back in service. That’s going to cost you time and money, and hurt your credibility. Don’t risk it. Kelly Tebon is the manager, aftermarket sales, for Dorner. He can be reached at Kelly.tebon@dorner.com; 262.369.1338. We are looking for a conveyor plate for model #: 202M08-0283400D010102-FDQNC, but have not been successful in our search through your website. Please let us know if you are able to help us locate a RIGHT side plate? We’d be happy to help you find the right side plate for your conveyor. Can you please let me know where your company is located so we can get your request to the representative in your area? You can also send your information to info@dorner.com.